Harp guitar with select tonewoods. The S-12 is the first U.S.A. made all-solid wood production line harp guitar in over 100 years. Simple appointments and regionally harvested tonewoods produce this great sounding affordable hand crafted instrument. It features a select north Idaho Englemann spruce top, mahogany back/sides and neck, spanish heel neck design, walnut binding, rosewood fret board and bridge, truss rod and a custom passive piezo contact pickup installed. Tuned F-G-A-B-C-D, the bass harp strings can be plucked to bring new voicings to the guitar and they also ring sympathetically adding natural sustain and reverb. 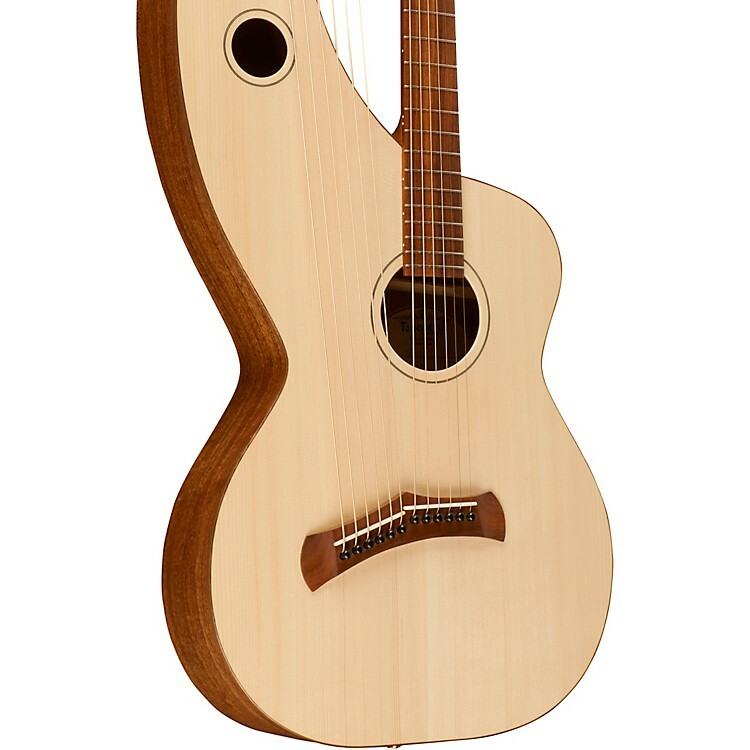 Harp guitars have traditionally been showcase pieces for great luthiers. They are incredible vehicles for displaying wood selection, acoustically engineered lines and cavity shapes, and masterful finish work. All of these categories of expression are present here in this breathtakingly beautiful instrument. It is a wonder to behold and a joy to play. With imaginative tunings, the sympathetic strings in the harp portion of the guitar speak in complex and complimentary ways that can become a part of your musical vocabulary. Soft case gig bag included. 33.125 in., 32.25 in., 31.25 in., 30 in., 29 in. Low E height @ 12th Fret: ~0.10 in. High E height @ 12th Fret: ~0.070 in. Low E height @ 1st Fret: ~0.023 in. High E height @ 1st Fret: ~0.013 in.